The M4 Sherman, formally Medium Tank, M4, was the primary tank used by the United States during World War II. It was also distributed to the Allies via lend lease. Production of the M4 medium tank exceeded 50,000 units and its chassis served as the basis for numerous other armored vehicles such as tank destroyers, tank retrievers, and self-propelled artillery. In the United Kingdom the M4 was given the name Sherman after Union General William Tecumseh Sherman, following the British practice of naming their American-built tanks after famous American Civil War generals. Subsequently the British name found its way into common use in the US. Following World War II the M4 medium tank was used by the US until the end of the Korean War. Many nations continued to use the tank in both training and combat roles into the late 20th century. "M4" might refer specifically to the initial sub-type with its Continental radial engine, or generically, to the entire family of seven Sherman sub-types, depending on context. Many details of production, shape, strength, and performance improved throughout production without a change to the tank's basic model number; more durable suspension units, safer "wet" (W) ammunition stowage, and stronger armor arrangements, such as the M4 Composite, which had a cast front hull section mated to a welded rear hull. And, the British nomenclature differed from that employed by the U.S. This version kitted by Dragon has been one that many armor modelers have been wanting. It does not have the cast hull, but has the three piece transmission cover and in this case, some scabbed on armor plating for the sides and turret. It also comes with the block tracks, something many other Dragon Sherman kits do not have. Like other Sherman kits, this one is not as parts intensive as some other tanks, containing a mere 330 pieces, though there are a number of parts not used. One thing about Dragon is that they are not opposed to making upgrades to provide the bits and pieces needed to give the most accurate armor kit they can. Especially nice are the DS tracks. These ar e really flexible styrene and are as detailed and easy to paint as any of their other parts. Markings are provided for two Olive Drab tanks during D-Day and a few days past in 1944. The box art tank is with Company C of the 70th Tank Battalion that landed on Utah Beach. The other, with a large Indian head on the side, is from the 37th Tank Battalion, 4th Armored Division. I must say that this is really a very nice looking kit. 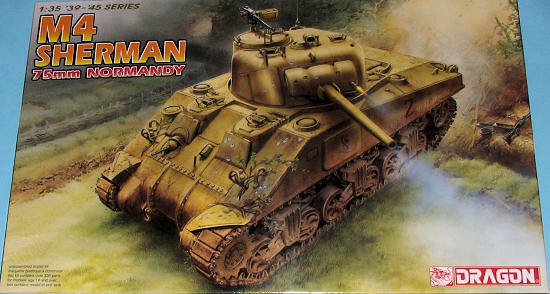 The completed model will make an excellent addition to your Sherman collection and is sure to be a very popular kit. 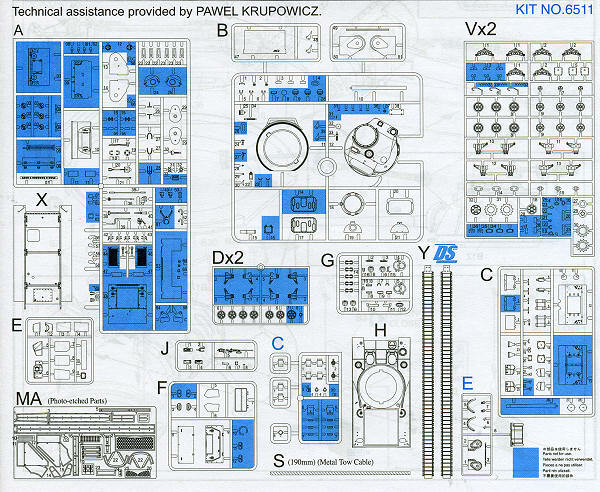 My thanks go to www.dragonmodelsusa.com for the review kit. Get yours today at your local shop or from your favorite on-line retailer.